But President Obama’s Cadillac isn’t really a Cadillac. In fact, about all it shares with the crested wreath sedans you can buy from your local dealership are some styling cues. Still, The Beast is definitely a sight to behold – and there are few times it is better showcased than during an inaugural. Not much is actually known about The Beast since it falls under the Secret Service’s classified motor pool, but a few specifications and secrets have leaked out over the last few years. We pieced through what we could to provide you with this breakdown of 10 things worth knowing about Cadillac One, Limo One or… The Beast. 1. It isn’t a Cadillac. 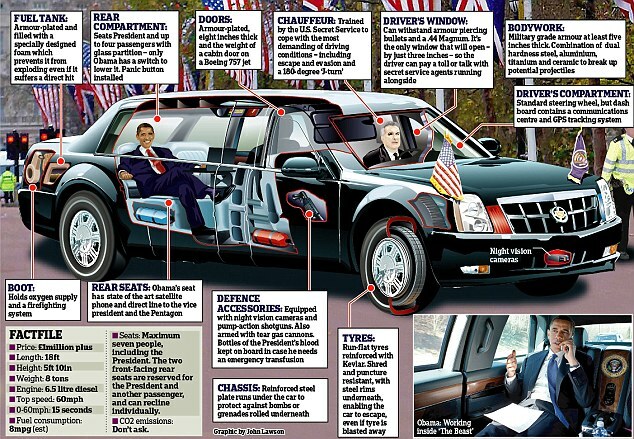 Unlike any presidential state car before it, The Beast shares little in common with a standard production car. Its chassis, diesel engine and transmission are based on those used in the Chevrolet Kodiak, a rugged commercial vehicle used as everything from a dump truck to a U-Haul truck. 3. Calling it armored is an understatement. There is probably not a better-armored vehicle with windows on the planet than The Beast. Its armor plating is said to be 8 inches thick and its doors weigh as much as those on a Boeing 757 aircraft. Five-inch thick bulletproof windows contain at least five layers to put a damper on any effort by subversives. And those gigantic, nearly bus-size Goodyear tires are Kevlar-reinforced run-flats capable of keeping The Beast on the road for quite some distance if needed. The interior is sealed off from the outside world to reduce risks of a chemical attack, while a special foam surrounds the fuel tank to insulate it in the event of an impact. 4. It’s exceedingly well-equipped. Pop open The Beast’s trunk and it is said that you’ll find everything from firefighting equipment and oxygen tanks to a cache of the president’s blood type. There are tear gas canisters, shotguns and, supposedly, grenade launchers, integrated into The Beast. The Secret Service has learned a lot since President John F. Kennedy’s open-top Lincoln Continental was fired upon on Elm Street in Dallas. 5. It holds seven passengers. At the very least, The Beast has three passengers aboard – the driver, the president’s lead Secret Service protective agent in the front passenger seat and, of course, the president himself. However, four additional seats in the back are available – three rearward facing spots on a bench and one spot next to the president for a guest. A folding desk separates the president from his guest’s spot. Somewhat surprisingly, the president’s bench is covered in a dark blue cloth rather than leather (although plenty of hide is on board). Shoulder belts that retract toward the center of the bench and buckle into the outboard corners – the reverse of a normal rear seat – are included. 6. The Beast is not alone. The Secret Service actually has a few Beast-like vehicles. Although it’s not known whether they’re all functionally identical, some look more like a Cadillac DTS than The Beast. The other limousines are used for high-ranking foreign officials and VIP guests when they’re in Washington, D.C. It isn’t known why the Secret Service rotates between presidential vehicles, however. 7. It runs on diesel. The Beast is believed to use a Duramax diesel engine closely related to that featured under the hood of Chevrolet and GMC’s full-size heavy duty pickup trucks. Why diesel? Aside from the durability associated with diesel engines, the fuel has a low volatility that reduces the risk of it exploding – and it can be found everywhere in the world, unlike high quality unleaded fuel. 8. Its pilot is a heck of a driver. Even though The Beast has more in common with a school bus than a sports car, its highly-trained drivers can execute tight J-turns and other police-style evasion techniques in the event of a situation gone south. The Secret Service drivers have undergone extensive training on a secluded site (believed to be a military base) with input from GM engineers and test drivers. 9. Its specs will not impress you. Burdened with lugging a rumored 20,000 lbs. worth of Beast around, the diesel engine isn’t a rocket. Hitting 60 mph from a complete stop takes about 15 seconds, which is more than just about any new car we can think of, and the big car’s top speed is said to max out at 60 mph. In addition, all that weight makes it a guzzler, sipping fuel at a rate of 8 mpg. However, it’s unlikely that D.C. will gain representation in Congress as long as Republicans are in control.